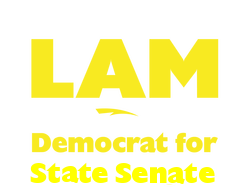 Welcome and thank you for visiting to learn more about our campaign for State Senate. I've had the honor of serving as a State Delegate representing Maryland's 12th Legislative District for the past four years. Following the retirement of our State Senator, I am proud to now be the Democratic nominee for District 12's State Senate. District 12 includes diverse areas in Baltimore and Howard Counties, and I’m a strong believer that our diversity is our strength because it unifies our desire to work together to improve our community. Please have a look around our site to learn more about the issues that I have championed for our community and some of the many issues that I will continue to fight for on our behalf. As a physician, I recognize the importance of being a good listener, and so I want to hear about the issues that matter to you. You are welcome to contact me by e-mail, Facebook, or Twitter at any time. And while you’re here, please consider signing up to receive periodic e-mail updates, volunteering to serve on our campaign, requesting a lawn sign to display in your yard, or making a contribution. I truly appreciate the outpouring of support that I have received from voters across our district over the past four years. Together with your support, I hope to be able to continue to serve you in Annapolis.